Media Supply and Nexcopy introduce the newly designed SuperSpeed 3.0 USB Duplicator, the SSUSB160PC. 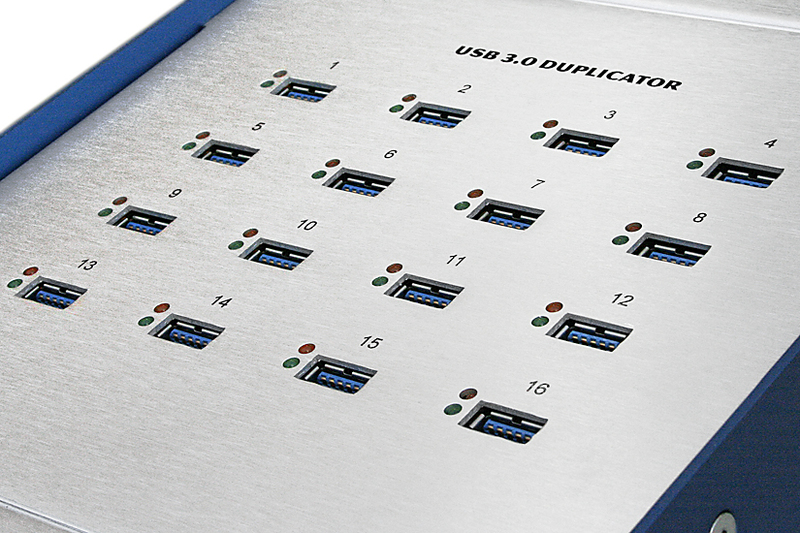 Now you can take full advantage of the latest USB technology with the SuperSpeed USB 3.0 Duplicator. The new, ergonomic design with a top-side loading process makes it the easiest system on which to load and unload flash memory media. The SSUSB160PC ships with Nexcopy's powerful Drive Manager software, providing you with a host of options for data loading, unique data streaming, device imaging and data collection. Copying USB drives with the SSUSB160PC is as easy as using a photocopier. With the user-friendly software interface, you can copy files to 16 blank USB 3.0 flash drives, simply and automatically. There's no copy-and-paste, no single drive loading and no hassles. The unit is a PC-based USB duplicator device, capable of copying at your flash drives maximum transfer speeds. Why is the SSUSB160PC a cost benefit to your company? Security - It's the number one issue in corporate America. The SSUSB160PC gives you control of your intellectual property, because the data loading process is taking place at your facility, not with a third party vendor. On Demand Prodcuction - Most organizations purchase bulk flash drives then decide what content to load. Sending out flash drives for duplication service takes time and costs you money; having an in-house solution gives you control over production. Imagine the possibilities - The Nexcopy Drive Manager software is a flash memory management software solution. From pulling IMG files off a network storage device, to unique data streaming to each device, Drive Manager software has a solution for you. Need data collection off USB drives, password control for production control or short image for full image binary copies of a physical master? It's all no problem with the SSUSB160PC! The PC based USB duplicator is thoughtfully designed with enough space between each USB port to accommodate most any flash drive. The SSUSB160PC comes with a 120watt internal power supply, capable of powering 16 external USB hard drives for trouble free SuperSpeed USB duplication. Order your Nexcopy SuperSpeed 3.0 USB Duplicator from the duplication experts at Media Supply. Simply click the "Add to Cart" button or call 1-800-944-4237 and select option 2. *File types other than FAT and FAT32 require the IMG file copy function. Nexcopy Drive Manager comes with a power Imaging utility to make a master IMG file from any device.